As usual, guran's anthos are just recompilations of much better books relesead a couple of years earlier. Joshi's Black Wings and Datlow's Lovecraft Unbound are the "sources of inspiration" for this one. I am very excited about this book, and happy to have one of my wee tales therein. The contents is especially good and there are a number of stories I have not had a chance to read. What a great line-up of writers! The book showcases Cthulhu Mythos tales written this past decade, and as such gives me confidence that we have much to look forward to in the Lovecraftian genre. 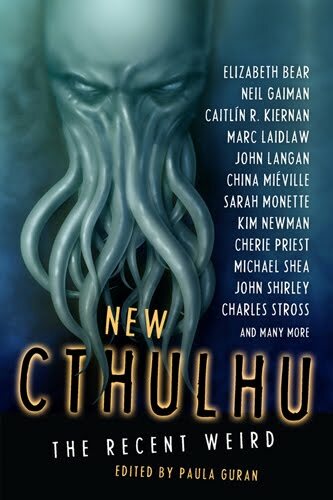 As a reprint anthology, this is extremely good, with a wide variety of approaches to Lovecraftian weird fiction. I myself have read only a handful of these tales and so I am grateful to have them all in one cover. The book is generating a huge buzz online and this bodes well for such books in the future. I am proud to be among ye eldritch crew of writers.